‘Tis the season for self-improvement! And wearing ALL the clothes. Sinead Halpin braved 20-something temps to teach a clinic at Road Less Traveled Eventing earlier this year. Photo by Katherine McDonough. Eventers, young horses and hunter/jumpers of all levels are all welcome for this eight-week winter gymnastic clinic series at Deerfield Stables! Gymnastic and adjustability exercises will build on the prior week’s lesson so riders of all levels can perfect their basics and prepare for their 2019 goals, whatever they may be. Dates include Jan. 12, 19 & 26, Feb. 2, 9, 16 & 23, March 2. Join Advanced-level eventer and popular instructor Kelley Williams for her annual Winter Clinic Series! 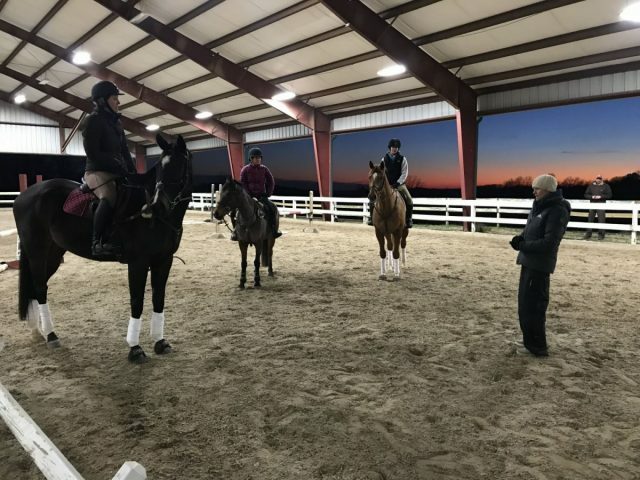 Known for her absolute dedication to her horses, her students, and her wonderful supportive family, Kelley has developed A Bit Better Farm from a small family barn to a leading event facility. Possessing an enviable amount of patience, she is a naturally gifted trainer and instructor who always seems to know what her pupils need, whether they be human or equine. Kelley draws great gratification in her teaching and coaching, and firmly believes that she learns as much from her students as they learn from her. Dates include Dec. 29 at Loch Moy Farm (Adamstown, MD), Jan. 5 Winter Clinic Series #1 at A Bit Better Farm (Brookeville, MD), Jan. 19 Winter Clinic Series #2 at A Bit Better Farm, Feb. 16 Winter Clinic Series #3 at A Bit Better Farm, Feb. 16 Winter Clinic Series #4 at A Bit Better Farm. Everything you need to know about show turnout, packing for you and your horse, managing your horse at a competition, stall set up, aftercare and more. Clinics held at Sandy River Equestrian Center. They will run from 9 a.m. to 5 p.m. each day and include lunch at noon in the bunk house. The cost is $175 for each clinic, or $750 for all five clinics when you pre-register and pay in advance. To register please contact Sam Henley, [email protected] or (549)488-5416; or Vicky Williams, [email protected] or (434)489-6414. Join USDF Silver Medalist Meghan Truppner at her Karmic Run Stables for a day full of cavaletti! All levels welcome from walk-trot beginners through more advanced pairs. Groups are limited to 3-4 riders to guarantee personalized attention. Looking for something interesting and beneficial to add to your horse’s exercise program this winter? Cavaletti work may be the answer! There are many variations you can use to benefit yourself and your horse. Cavaletti work encourages your horse to become more rhythmic and balanced, while adding a little interest to your flatwork. Dates include Jan. 5-6, Feb. 3 and March 3. School cross country obstacles on eight acres of all-weather footing. Ditches, banks, water, and portable fences from Intro height (18″) through Preliminary. By appointment only. The cost is $50 per horse/rider combination and includes use of the regular schooling course and trails. A ground person is required and safety vests must be worn. Call ahead and jumps can be customized to what you’re working on. Derby course is closed for schooling during competition days, but the schooling course remains available. Call or text Carolyn at 301-514-0111 or email us at [email protected] to schedule an appointment. More information and download the waiver and rules at https://themarylandhorsetrials.com/schooling-opportunities/cross-country-schooling. Tik Maynard and Cathy Wieschhoff are teaming up to host a clinic series on natural horsemanship solutions to eventer training problems, with sessions scheduled for every Tuesday in February at Majestic Oaks. Cathy and Tik will help you and your horse work through performance, behavior and connection issues in a hands-on learning environment designed to create a safer and more reliable partnership. Click here for more details on dates and pricing. The 2019 USEA Educational Symposium will take place February 18-21 at The Grand Oaks Resort in Weirsdale, Florida. The ICP symposium will be February 18-19 and you can register here. The YEH/FEH will be February 20-21 and you can register here. Partners of the Park series at Florida Horse Park. Cross country schooling ($50/horse), jumper show (18″-4′), dressage clinic (clinician TBD). More info here. Open cross country schooling on Saturday; Academy Schooling Show on Sunday. Horse trials offered at Sprouts (<18”) through Prelim/Training levels; combined tests offered at Sprouts through Advanced level; dressage tests and show jumping rounds — choice of any USEF/ USEF/USDF/USEA test/jumping height. Closing date is Feb. 18. Cross country schooling info is here; schooling trials info is here. Visit www.stableviewfarm.com. The University of Alabama Eventing Team is hosting a Lellie Ward clinic on February 23-24 at Timber Acres in Buhl, Alabama. Dressage will be Saturday with individual lessons for 1 hour. On Sunday there will be group jump lessons. It is $150 for both days or $80 for one day only. Stabling will be $20 per night, and the haul in fee is $10 per day. The audit fee will be $25/day. Lellie Ward has gone to the Rolex Kentucky 3-day event a total of four times on three different horses. She has also competed in many other US and Canadian events such as Bromont, Jersey Fresh, Gladstone, and Buffalo Texas. She has a USEA level III teaching certificate as well as certificates from Germany and the UK. She has produced 10 unstarted horses to the advanced levels including Peter Pan and Next Dance. She has also trained horses through Grand Prix dressage and show jumping. She can help any rider with any discipline. Please contact [email protected] to enter the clinic. Christoph Hess is an author, clinician and FEI “I” dressage and eventing judge. He is highly respected around the world as a teacher of riding and the development of the horse according to classical principles. He authored the book “Ride Better,” wherein he collects some of his very best riding and training tips along with well-honed insight related to the topics that he finds most often challenge equestrians and their equine partners. This clinic is hosted by Cathy Willson/Magnolia Farms and Andrea Haller. The clinic will be at Magnolia Farms, with Olympic-caliber covered arena, 16×16 stalls, LQ Trailer spaces, guest housing, and other amenities. Prices: Lesson $225, includes lunch and spectating. Spectating is $50 per day, includes breakfast, lunch and snacks. Please contact Andrea for more info at [email protected] or (386)623-2292. Polish your show jumping skills — 2’3″ – 3’9″ jumper classes available. Show begins at 10 a.m. Entry form here. Visit www.stableviewfarm.com. This clinic is designed for riders, trainers and judges and will go through the new USEF and FEI Eventing tests. Warm up exercises will be discussed and directives for each movement practiced before riding the tests with live judge’s commentary. Cost is $100 for riders and $40 for auditors. Sign up via email [email protected] or by text 352-425-6302. Location is Wentworth Farm, 12345 NW 110 Ave., Reddick, FL 32686. LandSafe is a two-day clinic (four hours per day) which implements specific exercises to help develop the muscle memory to give participants the tools to reduce their rider risk in a fall scenario. Participants will spend time on the gym mats and simulator each day to practice a variety of fall scenarios. For more information about LandSafe please visit www.landsafeequestrian.com. LandSafe received a grant from the USEA and still has funding available for each Area. Until the grant money is depleted, any current member taking the LandSafe clinic can receive a $50 rebate and if you are a USEA Young Rider you will receive an additional $50 rebate. The grant money is available on a first come first serve basis, so sign up early to receive the discounted price before funds run out. To sign up please visit https://landsafeequestrian.com/product/march-9-10-2019-big-time-eventing-canton-ga/. Please contact Keli Warrington if you have any questions about clinics: [email protected] or 484-459-4974.
name, level, and if a day stall is needed for $15. Levels: Green as Grass, Starter, BN, Novice, Training, T/P. RSVP on Facebook event page here. Hosted by L’Esprit Equestrian, Jennifer Rousseau. Limited stabling available: See Registration for details, available at https://www.lespritequestrian.com or visit on Facebook. Come join UK Eventing at the Sharon White Clinic. Two days of jumping at Clearview Equestrian Center. Sharon White is an international four-star event rider with over 20 years of competitive experience. Venue is Clear View Equestrian Center (3349 Elkchester Rd. / Lexington, Kentucky 40510). Click here for more information. Contact Allison Murphy at 307-640-9222 or [email protected].